This wood and canvas canoe was designed for use on lakes and wide rivers. The graceful, upswept, sheer, long-nosed torpedo ends, paired with the right length decks and some tumblehome give this model an attractive appearance. This canoe is great for solo paddling, but will also hold two people comfortably. It is fast and will track straight on the lake while riding over waves because of the full torpedo style ends. The tumblehome at the gunwales allows for an easy paddling reach. You can paddle this alone with a double paddle to go upstream against a current or to get to the far side of the lake in a timelier manner. Constructed of cedar planks and ribs, it has butternut or cherry decks and trim, with hand-caned cherry seats. The keel and outer stems are of ash and brass stem bands protect the hull. Brass flag holders, floorboards, lettering and gold trim are optional. Small sail rigs would work well with this canoe and it could be decked over as a sailing canoe. 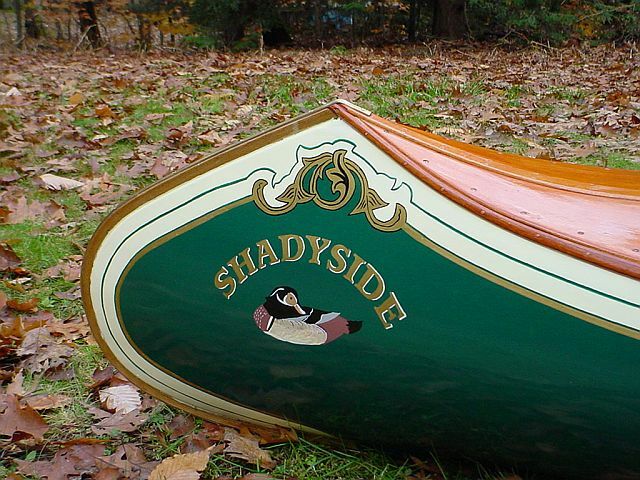 When paddling alone with a single paddle, this design along with the 17’ model, allows you to tip the canoe on its side and ride the tumblehome with an easy paddling stroke.